1. This band is for arm size from 9" to 16"
Imagine doing everything that you want with easy access to phone calls, music, apps, messages and anything else that’s important for you!!! 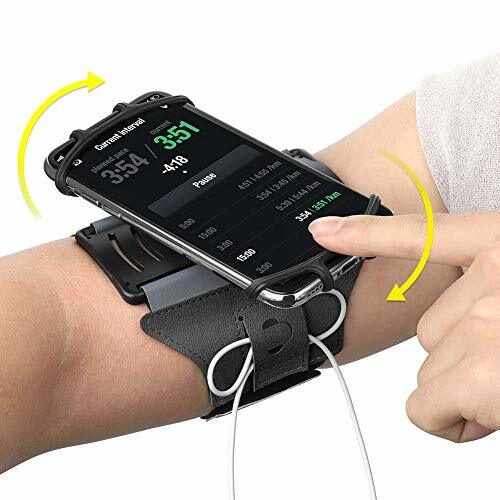 *Hands-free & full smart phone usage: The armband is ultra Lightweight (2.0oz) for speed and comfort during all activities. Completely access to all buttons and controls of the smartphone. You can catch any message and call conveniently and capture every perfect moment with this 180° rotation armband that Sits Snugly on Your arm. ** Safe & Easy to use: The rubber holder is strong and awesome, hold the phone tightly and securely to arm, no need to worry about losing the phone. Cell phone can be fastened to and removed from armband with ease. ** Quality Material: This workout Armband is made of the highest quality elastic velcro, no matter how you twist and bend but not stretch out of shape. It can stand up to the toughest of workouts and marathons. ✅UNIVERSAL FIT BAND: Two slots provide double fastening sizes, easily fits any arm size from women small arm 9 inch to man large arm 16 inches.